(C) the rest of the seed. 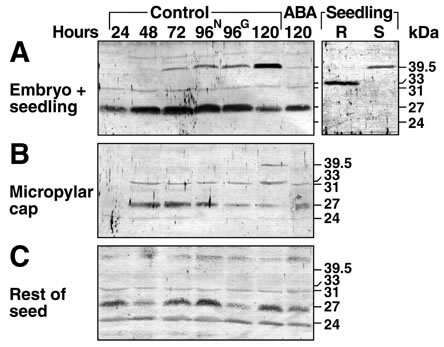 Immunoblot analysis of seed and seedling extracts (40 μg protein/lane) probed with the rabbit anti-tobacco ßGlu I antibody, which recognizes all known tobacco ß-1,3-glucanases and is also known to cross-react with tomato ßGlu I (Neuhaus et al., 1992; Beffa et al., 1993; Petruzzelli et al., 1999; Wu et al., 2000; Kunz et al., 2001). No signals were obtained in control blots with rabbit anti-tobacco Chn I antibody or with rabbit pre-immune serum. Extracts and germination are as described in Fig. 3. R = root, S = shoot.